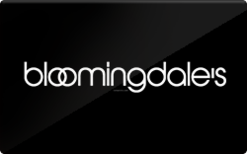 Bloomingdales is an upscale chain of departments stores. They carry Burberry, Gucci, Hugo Boss, Ralph Lauren, Salvatore Ferragamo, and more. Buy a discounted gift card to save on top of sales and promotions.